Leading industry retailer helps makers show off their handmade creations, offers variety of crafting classes at events across U.S.
RHINEBECK, N.Y.–(BUSINESS WIRE)– Individuals will have a chance to hone and showcase their creativity at the 2017 Country Living Fairs, thanks to the nation’s largest fabric and craft retailer. 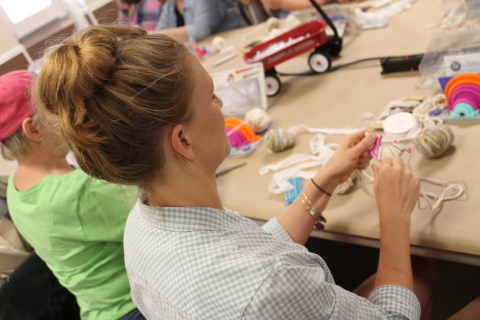 As a sponsor of all educational classes offered at the Fair’s regional events, JOANN is helping attendees learn and practice their skills through a wide variety of crafting classes, and is also sharing its booth with some talented creators. The Country Living Fairs bring the magazine’s content to life and give readers access to a unique shopping experience in four special outdoor settings across the country. Each Fair features 200+ vendors from more than 25 states, and is expected to draw more than 20,000 visitors from across the country. Vendors include antiques sellers, food purveyors, artists, furniture makers, crafters and more. Attendees also have the chance to meet Country Living editors and their special guests, attend cooking, crafting, and DIY demonstrations, book signings, sample locally-sourced, artisanal food, and shop the Country Living General Store. Following the Rhinebeck event, two additional Country Living Fairs will be held in Columbus, Ohio (September 15-17) and Atlanta, Georgia (October 27-29). JOANN’s social contests for sponsorships to attend those events are expected to open in July. For more on the Country Living Fair, visit www.countryliving.com/country-living-fair. For nearly 75 years, JOANN has inspired creativity in the hearts, hands and minds of its customers. From a single storefront in Cleveland, Ohio, the nation’s leading fabric and craft retailer has grown to include more than 865 stores across 49 states, and is the only industry business to offer online orders. With the goal of helping every customer find her Happy Place, JOANN serves as a convenient single stop for all of the supplies, guidance and inspiration needed to achieve any project or passion. For store locations, project ideas and a full product offering, visit joann.com.